In microwaveable bowl, mix oil, red pepper and garlic. Microwave oil until hot. Add honey, soy sauce and salt to oil and mix well. 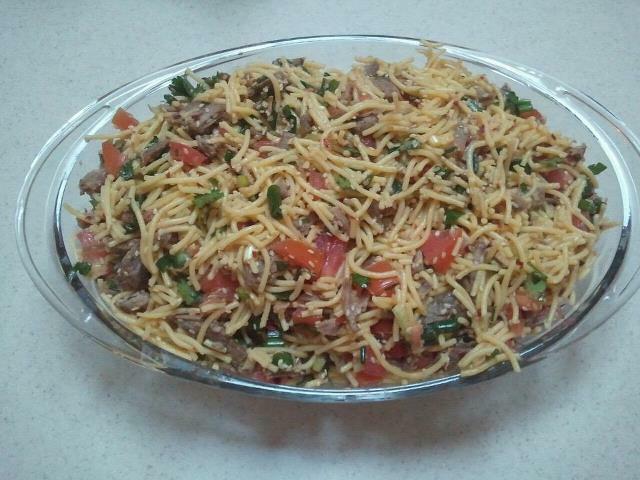 Mix spaghetti and remaining ingredients (except garnish) in bowl, and pour oil mixture over them. Toss until mixed evenly. Cover and refrigerate overnight. Toss pasta 1-2 times w/in 24 hrs. Toss before serving and garnish with extra cilantro and toasted sesame seeds. This is excellent for potlucks or picnics as it is delicious served cold.